Modal Auxiliary Verbs... An Anchor Chart and FREE Posters! Modal Auxiliary Verbs... I have to admit, when I first ran across this term in the 4th grade Common Core language standards, I had no idea what modal auxiliaries were. CCSS.ELA-Literacy.L.4.1.C Use modal auxiliaries (e.g. can, may, must) to convey various conditions. Other than the three examples, the standard itself didn't provide much information for me, so I had to do an Internet search on the topic... and I quickly became overwhelmed! I knew immediately that it would be difficult to teach the subtle nuances between these words in this special class of helping verbs- especially to my English language learners! Ultimately, I decided that students will gain proficiency in this area if they are introduced to the modals, and then have plenty opportunities to interact with the modals themselves. 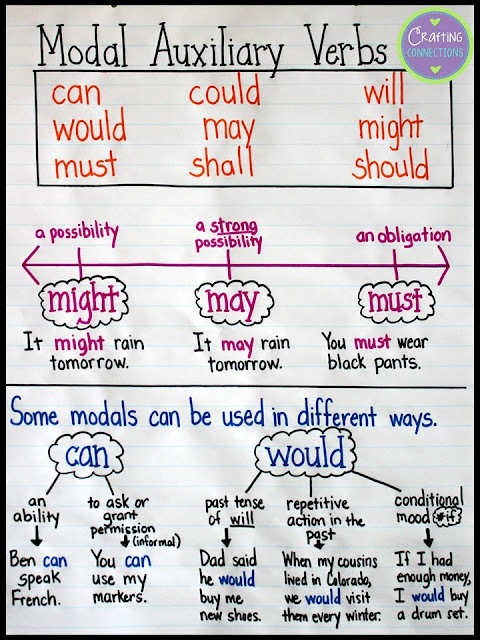 Today, I'm going to share my modal auxiliary verbs anchor chart and a followup activity that will help your students understand how to use modal auxiliary verbs. First of all, here's the anchor chart I created to accompany this standard. (I always introduce new standards with a PowerPoint presentation, so I would create this anchor chart on the second day of my unit, when students have some prior knowledge on the subject.) I recommend getting your students involved in the creation of this anchor chart by having them help you create the example sentences. I also created the following "politeness" activity to do with students after the anchor chart has been created. One of the articles I ran across on the Internet addressed how different modals convey different degrees of politeness in certain situations. As a teacher of English Language Learners, this is something that I wanted to be sure to point out to my students. While these nuances may seem obvious to native English speakers, they can be quite confusing for ELLs. I would begin by telling my students that we are going to play a little game to test our "politeness" levels. I would stress that this game isn't for a grade... it's just for fun! I would display the first poster using the document camera, briefly discuss the directions, and then have the students record on a scrap of paper which character's statement was more polite. 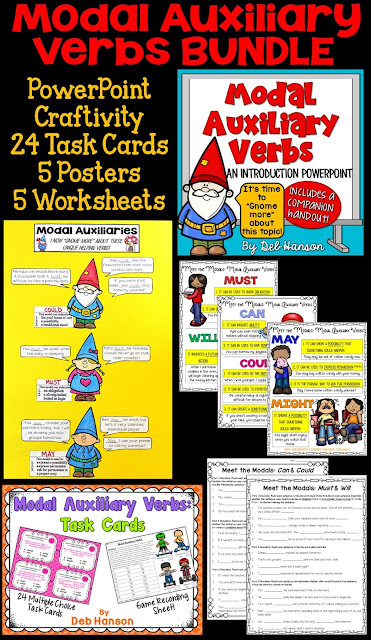 If you are looking for additional student-friendly materials for teaching your students about modal auxiliary verbs, feel free to check out the bundle that is available in my store! Thanks for stopping by today! Come back soon!